It's April 1st in Japan and that means it's time for Rockman Unity's annual April Fools' Day post. This year, to mark the end of the Heisei period, Ucchy-san takes us on a journey back through time, showing off various Rockman Unity April Fools' Day pranks from the period. Most of these pranks actually didn't happen, like the construction of a 226-foot-tall golden Rockman statue, multi-colored Ver.Ke X figures, and a soft vinyl Battle & Chase-style Roll figure, among other things. All of these things sound super neat and would have made for fun products. However, what really whets the appetite is the product behind Ucchy's incorrect April Fools' Day 2018 recollection: a Rockman X 25th Anniversary Keisuke Mizuno (Ver.Ke) Sigma figure. Hot dang. As you know, this wasn't the real 2018 April Fools' Day prank. But it is no doubt the centerpiece of this year's festivities. So the question is, can we expect Ver.Ke Sigma to actually become a real product? Don't forget: many past Rockman Unity April Fools' Day pranks ended up becoming legitimate figures. There was the D-Arts Ultimate Armor X in 2013, Ver.Ke X in 2014, Gigantic Series Roll in 2015, and the "Subaru Style" Shooting Star Rockman 4Inch-Nel variant in 2017. You might even own some of this figures. As per usual, only time will tell. For now, do admire that fine artwork by Keisuke Mizuno. It's archived on archive dot is but I don't think the images show up. It's quite impressive. It's a shame this is only an April Fool's joke. But as history has shown, some April Fool's jokes become reality. They already have, he seems to be the main illustrator for the series indicative of MMXLC. They really, REALLY need to hire this guy for art design when they start working on X9's character cast. There's not a single Ver. Ke design that hasn't looked freaking amazing. Even so, they're highly impractical or a little too pointy. The Sigma emblem etched on the glass is stylish as hell, though. Teasing Megaman merch that isn't going to exist is a load of bs if you ask me. Moreso for characters that don't get enough love. I want this but with a bit less kibble. If that's not possible, I'm okay with it as-is. This could be an X9 design and people thinking it's for merch that would be the joke. If we really do ever get a x9 that would be even better, been wanting another x series game since 2005. Since Megaman 11 was made I think there might be a chance eventually. These ver. ke designs would be pretty cool in game. Since X, Zero, Axl and now Sigma got Ver. Ke. forms, i'll just wait until Vile Ver. Ke. is a thing. 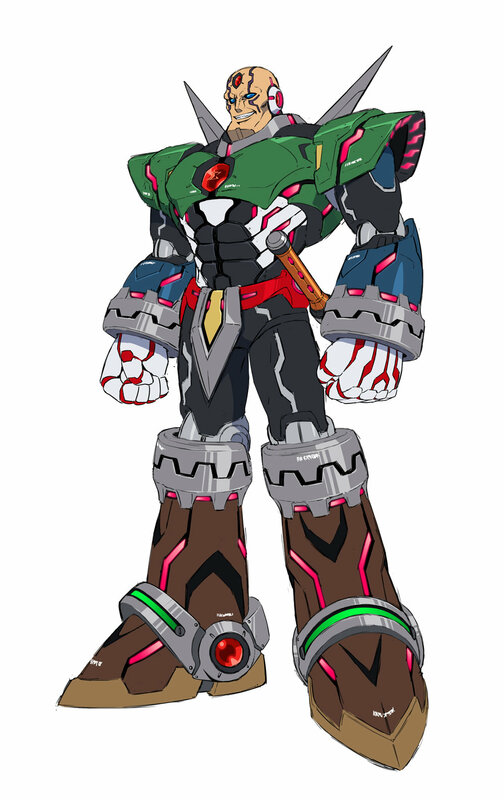 I know it's a common motif throughout the Ver.ke designs, but the highlights along the armor really work well with Sigma. Almost implying his virus is going to rip through its frame. That's a good way to look at it. He had quite a bit of red dots in his MvC:I X5 costume. X9 X9 X9, that's all that I goes through my mind when I see these Ver.Ke designs. X9 with these designs would be perfect. To me, this is how you modernize MMX's design correctly. Not X8's anorexic tube-loids, not the cancelled Maverick Hunter FPS's overdone, psuedo-detailed, 50 million lines going everywhere, totally not nu-Iron Man, trainwreck "design." Really? I think there's a lot of unnecessary details on this, if you consider that to be lines. I agree. the designs are nice but overly busy for the sake of it. while i do prefer the Ver.ke over the MMX8 designs of the guys, of which i was never much of a fan, i think it fit better as a alternate design thing for figures (or maybe to be included as a bonus costume in a eventual X game). I kinda agree that it is too charged, and change a bit too drastically from the previous shape of the characters, too. I would love a new series after ZX called Mega Man Future X or Mega Man XZ where the real X and Zero and Sigma are back... not Biometal form... and they have these designs. you know if they want o make a game with the protagonist of the X serie, then they can just make a game in the X serie. That's the whole point of the multi-serie aproach, they can make differents things with different characters and theme whithout closing the possibility of more game in the others series. What is this tradition now? Ver.Ke is the new style for the X series. Period. PS: Ver.Ke Zero, Axl, and Sigma figures. Now. That would be cool as a figure. If not then this is a great piece of art.